As interest rates have risen, much attention has been paid to the effect rising rates may have on the housing market. While interest rates do play an important role in your monthly mortgage payment, they are not the only factor to consider. Principal: The principal part of your monthly payment pays off the loan amount you initially borrowed to buy your home. Interest: In return for providing the funds you need to buy a home, lenders charge monthly interest on the principal balance you owe. Taxes: Property taxes may be collected by your lender on a monthly basis and held in an escrow account to be paid on your behalf as they come due. The good news is: property taxes are usually fully deductible at income tax time. Consult a tax advisor for details. Homeowners Insurance: Homeowners insurance provides financial protection in the event of losses that are the result of fire, wind, natural disasters or other hazards. 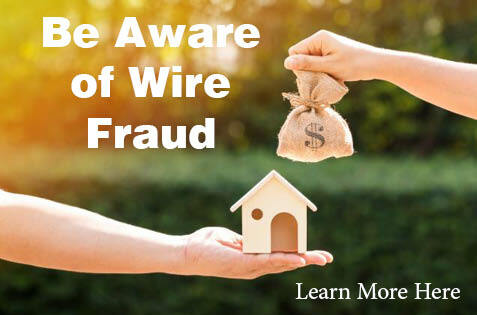 Most mortgage lenders require you to have a homeowners insurance policy and may also be collect these funds to hold in an escrow account to pay your insurance company. Mortgage Insurance: Mortgage insurance protects the lender against financial loss if a customer fails to repay the loan. If mortgage insurance is applicable to your loan, that part of your payment is forwarded to the agency providing the insurance. If you have questions, our mortgage consultants are always available to help you understand the home loan process! Please also check out our on-line resources such as our mortgage payment calculator or our house hunting checklist! This table is only to be used as a guide and does not include all loan types or loan features. Not all loan types are available to all borrowers. Borrowers will be subject to qualification and must satisfy all underwriting requirements and conditions. Not all borrowers will qualify. Speak with your mortgage consultant and carefully consider each of your home financing options so you can determine the home loan that is right for you. We are pleased to share that Prosperity Home Mortgage, LLC, (Prosperity) has been recognized for its exceptional mortgage originators once again by Mortgage Executive Magazine. In its Spring 2018 edition, the industry publication honored the Top 200 Mortgage Originators in America and the Top 1% of Mortgage Originators in America. 30 members of the Prosperity team were named to these exclusive lists. Three of Prosperity’s mortgage consultants ranked among the Top 200 Mortgage Originators in America by annual mortgage volume. 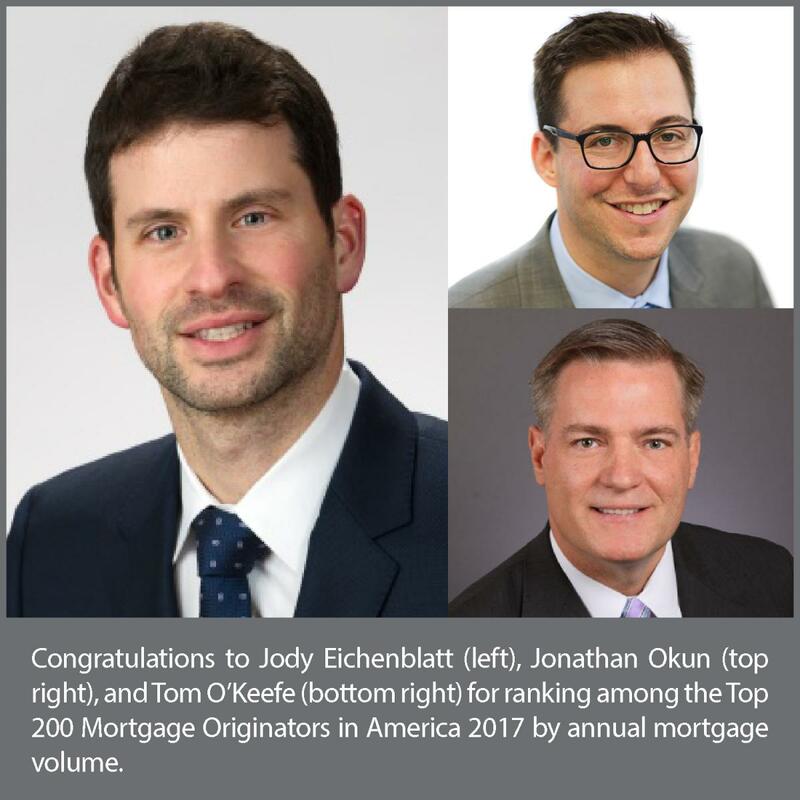 Jody Eichenblatt, a senior mortgage consultant based in Alexandria, Virginia, was ranked No. 71 on the list. He closed 264 loans for a total volume of $116,257,039 in 2017. Jonathan Okun, a senior mortgage consultant based in Bethesda, Maryland, earned the No. 93 spot on the 2017 list with 208 closed loans and total volume of $103,326,636. Thomas O’Keefe, branch manager of Prosperity’s office in Bethesda, Maryland, was ranked No. 144 with 183 closed loans and a total volume of $89,488,607 in 2017. J. Ryan Dailey, Washington, D.C.
1. Start searching for a real estate professional. You’ll need a well-informed, trusted guide throughout this process so start looking for a real estate agent to work with. Ask friends and family members for recommendations then do your research online to evaluate any individuals and conduct in-person interviews as well. Be sure to speak with at least three agents before choosing someone to work with. 2. Figure out what you can afford. Before you start looking at neighborhoods and homes, determine what you can comfortably afford... the key word being “comfortable.” There are many unexpected expenses that arise when you’re a homeowner, so don’t stretch yourself too thin. 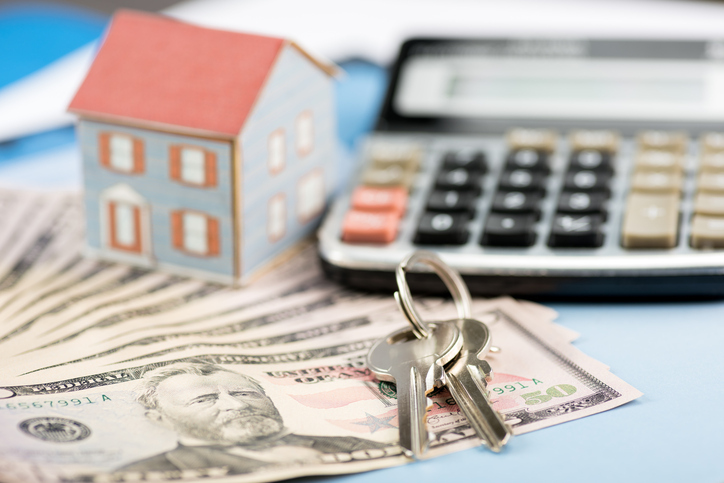 Determine how much you can afford for a down payment, then use an online mortgage calculator to see what your monthly payments might be for various-priced homes. Once you’ve arrived at your budget, stick with it. 3. Pick your neighborhoods. Choose your location before you start looking at homes, as where you live will ultimately be more important - both in terms of your day-to-day happiness and your investment - than the home itself. You may have to compromise a bit on location depending on the home you can afford. Your real estate agent can help advise you here. 4. Choose your musts. When thinking about the home you’d like to buy, take an honest look at needs vs. wants. Sure, there are a lot of things we’d love to have in our dream home, but figure out what are the nice-to-haves vs. the must-haves. Use a house hunting checklist to rate the features and condition of homes you view. 5. Search online. Once you’ve got your price range, your neighborhoods, and your must-haves down, start your search online to narrow down your options. Your real estate agent may also know of some homes that fit the bill right off the bat. This will mean fewer homes to visit in person and hopefully, lead to a quicker selection. Above all, be open minded, flexible and patient in the home-search process. Your opinions and priorities may change as you learn more, and despite the best planning, curve balls happen. The journey will be well worth it, however, once you’re happily settled as a new homeowner. When you’re ready to discuss your home financing options, contact a local mortgage consultant who can answer any questions you have about the mortgage process. When home buyers begin house hunting, they often find that the home buying journey can be a lengthy process. Finding a place with the right combination of must-haves and nice-to-haves can be complex and time consuming. How much square footage is needed? Should the property be close to parks, shopping, or services? Will the commute to work be acceptable? These types of questions are important, but they can be overshadowed by the possibility of rising mortgage rates as buyers apply for a home loan. 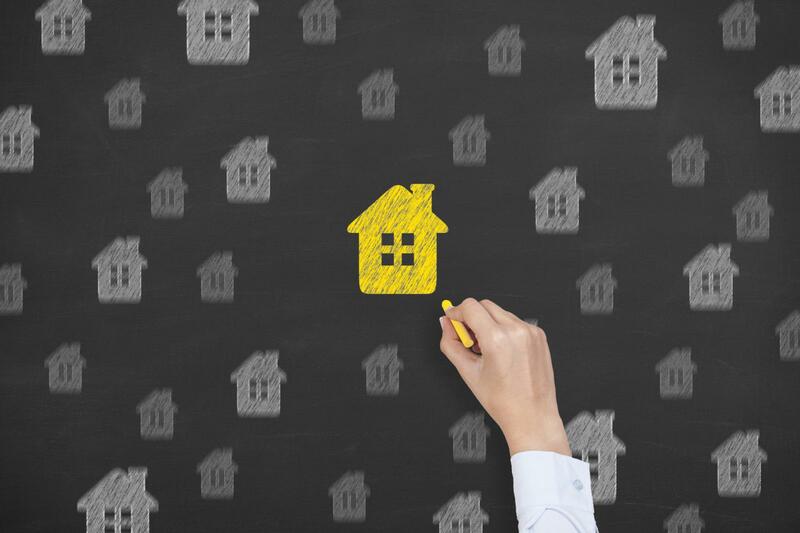 While interest rates should not be the only concern when obtaining home financing, the rate does have an impact on the loan amount for which a buyer can be approved. Quite simply, a lower interest rate can mean more buying power. When interest rates change, we still want our clients to be able enjoy an exciting path toward homeownership, not one filled with anxiety about rising rates. That’s why current home buyers may be interested to learn about the Prosperity Buyer Advantage: Lock, Shop & Home loan program, which provides an opportunity to counter the worry of rising interest rates. The Prosperity Buyer Advantage1 allows buyers to get much of the home financing process out of the way and obtain a Commitment Letter, which can help set their purchase offer apart from other offers a seller may be considering. Participating in the Prosperity Buyer Advantage costs nothing additional and can help prevent last-minute issues with home financing, so buyers can enjoy an on-time loan closing. No property address is needed at the time of application and rate lock. Conforming and high balance loan amounts are available. Want to learn more about the Prosperity Buyer Advantage: Lock, Shop & Home loan program and see if it's the right fit for you? Contact a mortgage consultant near you! 1. Prosperity Buyer Advantage is not a loan approval. Ask your mortgage consultant for details about Prosperity Buyer Advantage. A Commitment Letter is based on information and documentation provided by you and a review of your credit report. The interest rate and type of mortgage used to approve you for a specified loan amount is subject to change, which may also change the terms of approval. If the interest rate used for credit approval has changed, you may need to re-qualify. Information provided by you is subject to review and all other loan conditions must be met. After you have chosen a home and your offer has been accepted, final loan approval will be contingent upon obtaining an acceptable appraisal and title commitment. Additional documentation may be required. 3. Lock, Shop & Home program is not available for bond, jumbo, or renovation loan programs. Myth No. 1: You can’t afford a down payment. Many would-be homebuyers opt for renting believing that they won’t be able to save enough for a 20 percent down payment. But in reality, not all loan programs require a 20 percent down payment. Different loan programs require home buyers to put down different amounts as low as 10 percent, 5 percent, or even 3 percent. In fact, some programs require no money down, and in some areas, down payment assistance programs are also available. Myth No. 2: Renting is cheaper. 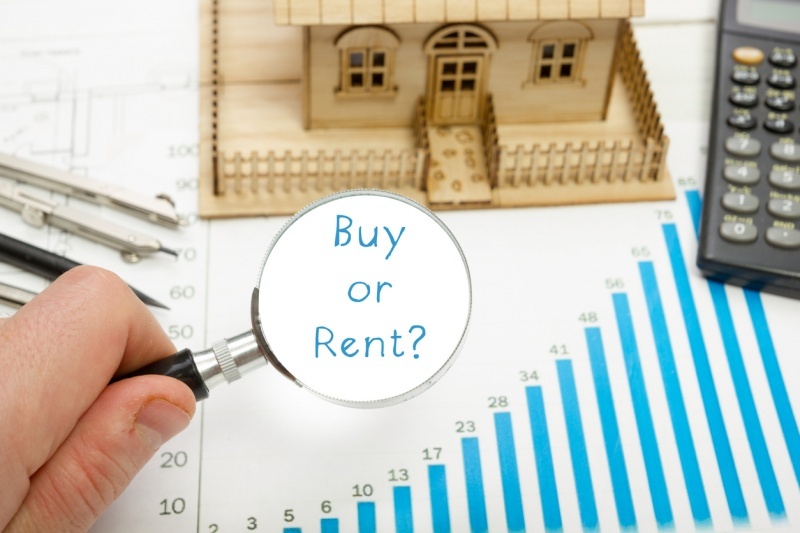 This statement depends on your rent and the home values in your area. But even if your monthly mortgage payment ends up being a little higher than what you might have paid in rent, that money is going toward your own long-term financial investment. When you pay rent, you are making your landlord’s mortgage payment rather than your own. Talk to a mortgage consultant to determine a monthly payment with which you are comfortable, and compare it to the cost of renting to determine which is right for you. Or, use our Rent vs. Buy calculator to get started! Myth No. 3: You won’t recoup your money. Real estate is often considered to be a safe long-term investment because home values have historically risen over time. 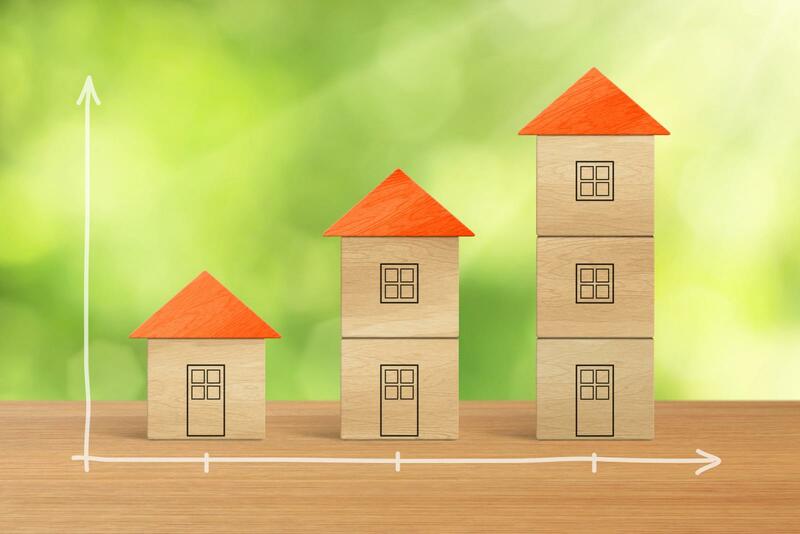 Yes, the housing market may go through cycles, but if you plan to be a homeowner for a long time, your home can build equity and prove to be a wise investment. Myth No. 4: Renting is less of a hassle. While you may have less vested in a rental property, the work you put into turning a house into your home can be a richly rewarding experience. Not only can you create a home that suits your preferences without the concern of a landlord’s limitations, improvements you make to the property can also help build upon your initial investment. If you’d like more homeowner information, please contact a mortgage consultant near you!